Microinteractions are a great way to improve your website’s user experience. And in this post, you’ll learn exactly what they are, plus how to use microinteractions in WordPress without needing any special technical knowledge. ‘Microinteractions’ are small moments where your site responds to a visitor’s actions. However, don’t let the ‘micro’ part fool you. Paying attention to these small details can actually result in some pretty large positive effects – such as increased user engagement and even additional conversions. In this article, we’re going to explain what microinteractions are and why they’re useful. Then we’ll show you three ways to implement microinteractions in WordPress, easily and quickly. Let’s jump right in! While you may be unfamiliar with the term ‘microinteractions’, there’s no doubt you’ve seen them in action. In fact, this technique has become so ubiquitous across the web that it’s now expected of most sites. In the above example, you can see that as the viewer mouses over each icon on Facebook, it enlarges slightly and moves around. You probably encounter features like this all the time, sometimes without noticing it. 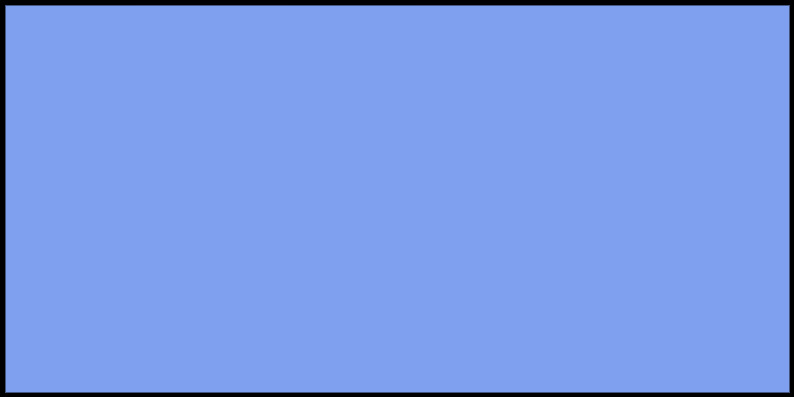 An element (such as a button or link) that changes its size or color when it’s hovered over or clicked on. A pop-up element, such as a tooltip or social sharing options, that appears when you highlight text or hover over a specific part of the page. Small animations that play in response to a particular user action, such as ‘status’ animations to let you know a download is in progress, or a purchase is being processed. What’s more, there are a lot of reasons to implement these types of microinteractions on your own site. To start with, users expect to see them at this point, and they make your pages more fun. Plus, they provide direct feedback on a user’s action, and they can even serve as a small psychological reward for interacting with your site. As it turns out, using microinteractions is one of the best ways to improve the User Experience (UX) on your website. When used as a part of your Call To Action (CTA), they can even increase sales and other conversions. Microinteractions provide so many benefits that there’s no reason not to include them on your site in some fashion. This means you’ll need to learn how you can employ microinteractions in WordPress. There are many types of microinteractions, and an almost infinite way to use them on your site. 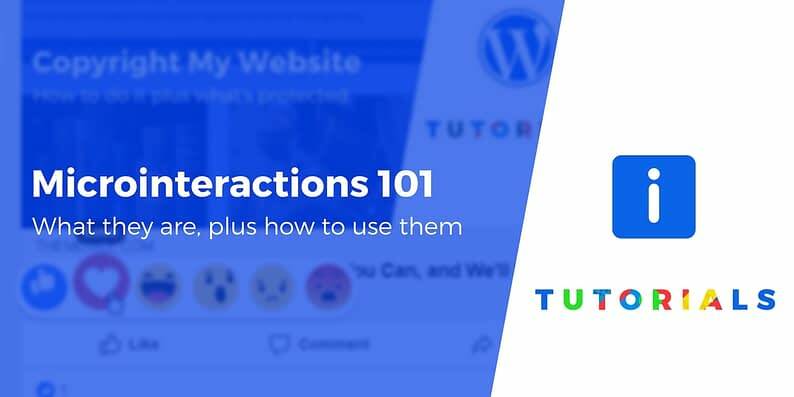 To get you started, we’re going to show you how to quickly incorporate a few of the most common microinteractions in WordPress. Let’s take a look! Let’s start with animations. This is something we touched on earlier, when we looked at the Facebook ‘like’ buttons. You can create a similar effect, by making elements on your pages play short animations in response to specific triggers (such as a click). 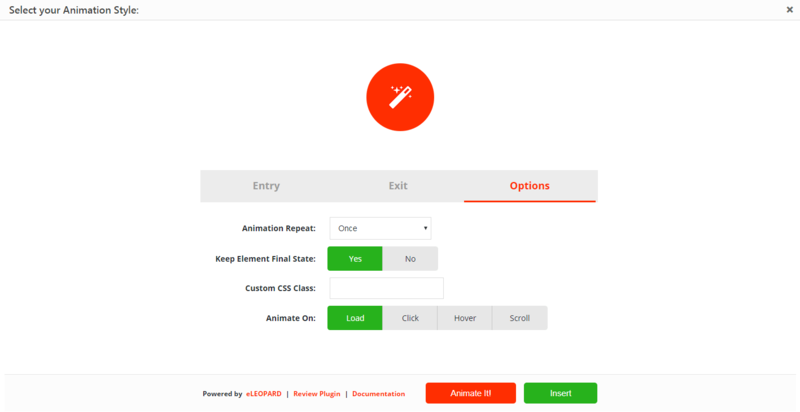 This plugin is free, simple to use, and offers a lot of customization options. However, you’re not required to create brand-new elements. Instead, you can add animations to practically any pre-existing element on your site, including simple text, links, buttons, and even images. 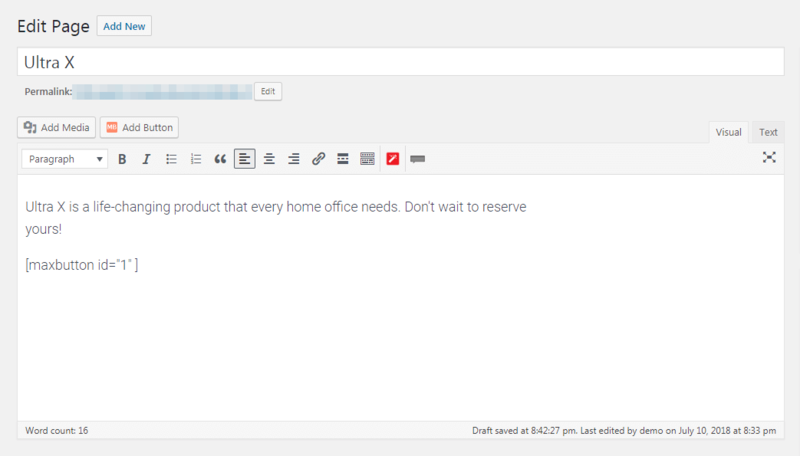 This is far more interesting than a static button, and encourages the user to click through to our sales page. There’s a lot you can accomplish with this plugin, so we definitely recommend trying it out for yourself. Animations are fun, but microinteractions in WordPress can also be informative – let’s demonstrate what we’re talking about using ‘tooltips’. These are small snippets of information that appear upon hovering over a specific section of text, a link, or another element. This is a great way to provide extra value to your website’s visitors. You can explain a term, concept, or instruction more clearly without taking up extra space on the page. 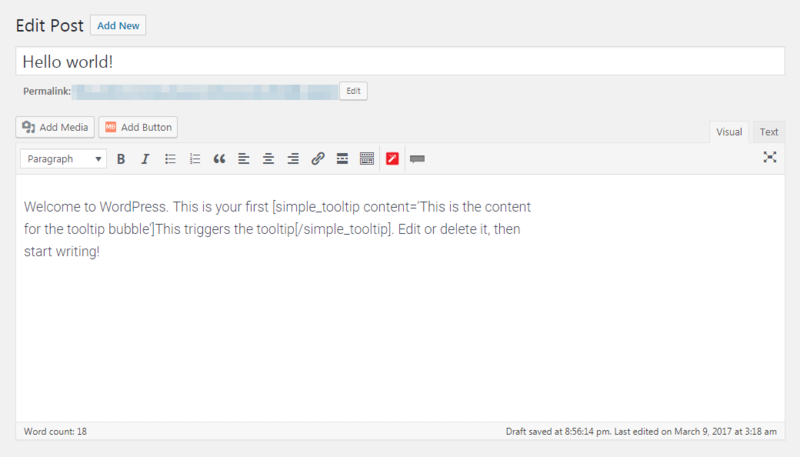 Plus, by making the tooltip an optional element, you don’t risk patronizing readers who don’t need the information. The above two techniques create microinteractions that can be used for a variety of purposes. However, some microinteractions in WordPress are designed to accomplish a specific goal. Such is the case with our last example. Encouraging visitors to share your website’s content is an excellent strategy. You get them to engage more directly with your content, and in return you receive some free marketing. What’s more, social media is arguably the most powerful tool you have for building an online audience. Once again, this is a tool we’ve selected because it’s free, simple to use, and reliable. What’s more, it requires very little configuration. 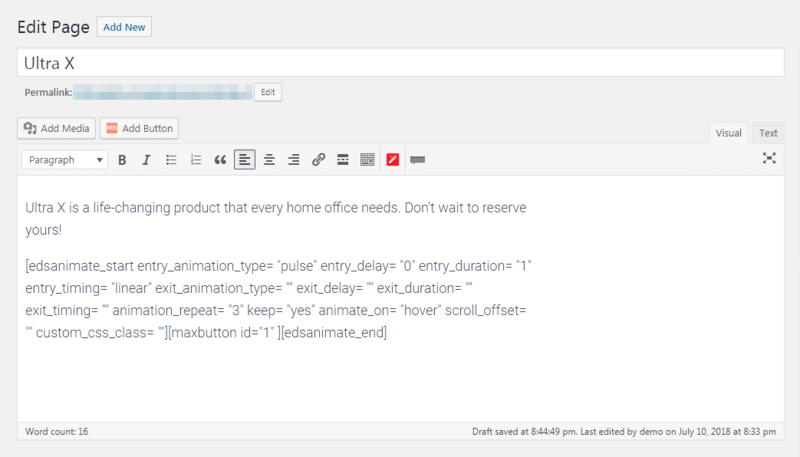 In fact, the plugin’s features will be implemented automatically upon installation. Clicking on one of these buttons will open up the visitor’s profile and prompt them to create a post including both the text they highlighted, and the URL of the page it came from. With this simple microinteraction, you’ve made it far more likely that users will think to share your content with their own social networks. It’s easy to get so focused on your site’s large-scale elements that you forget to pay attention to the smaller details. However, the latter is often what makes your site feel polished and compelling. Microinteractions, for example, are a perfect way to make sure your UX is top-notch. Add fun animations to important elements. Display helpful tooltips for your readers. 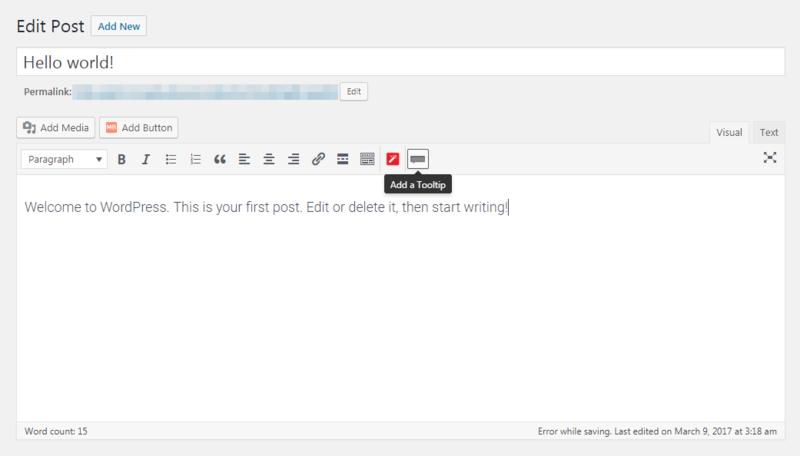 Prompt social sharing on your posts. Are there any other types of microinteractions you’d like to use on your WordPress site? Share your thoughts with us in the comments section below!